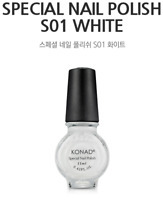 Konad Nail Art Set S include m45 french manicure. use only konad special polish for the design. Image Plate:m45 french manicure. Instructional Demo Video. Clean Stamp, Scraper, and Image Plate with nail polish remover.